Get authentic tube overdrive sound from your pedalboard. Gain one controls the first gain stage from a pure clean boost to a naturally compressing overdrive. Gain two shares one knob with the Bass control. It cleverly controls the gain and the low-end of the next gain stage, which adds rich harmonics, bottom end and natural, tube-like saturation to your tone. It's designed as an active high-pass filter for the second gain stage and allows you to set the amount of bottom-end with precision. The result is rich, harmonic overdrive. It's versatile and bold: with the Gain switch on Lo, the No.1 ranges from a barely-breaking-up overdrive to a classic crunch. With the Gain on Hi, you can take it from an aggressive, dirty rhythm tone all the way up to a beautiful lead tone. 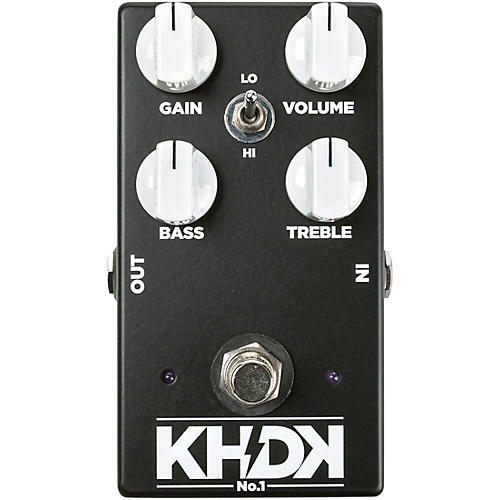 No.1 utilizes KHDK's original true bypass circuit using our special blend of solid state and MOSFET technology. Like all KHDK pedals, No.1 is proudly crafted and quality-tested in Kentucky, USA. Gain controls the unity gain of the circuit. Volume controls the overall output volume of the No. 1. The HI/LO switch is tied directly into the gain. The lo setting offers a warm, tube-like boost and a subtle crunchy overdrive, great for rhythm playing. The hi setting adds saturation, sustain, low end and compression. This setting is recommended for a more powerful rhythm or soloing. Bass controls the bass and lower mid-frequency gain. The bass is tied into the gain, making it a secondary gain control and enhancing your low end. Treble control is a passive, natural sounding low-pass filter. It cuts high end and offers a wide frequency range. Turned clockwise, it becomes raw, aggressive and cuts through. Turned counterclockwise, it cuts highs for a more mellow and warm tone. Footswitch engages your No. 1 to “on” or True bypass mode.